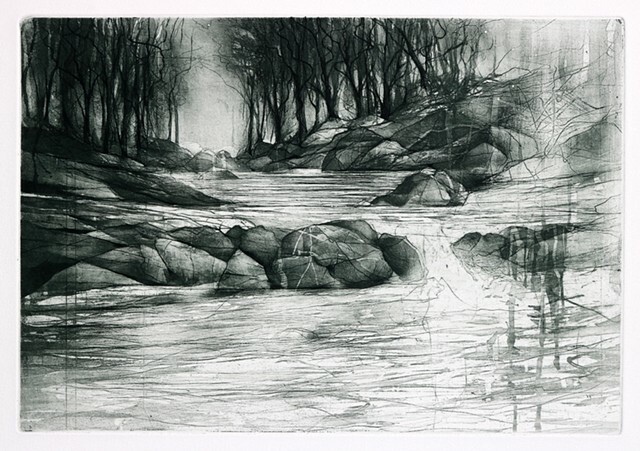 I did the initial soft-ground drawing from life, standing on a rock along the northwest branch of The Anacostia just downstream from the Burnt Mills Falls. Everything is very thick, very dense there. Even the air was heavy that day. The bones of the image remain from that initial drawing, but the atmosphere changed quite a bit. I was having a lot of fun dripping sugar-lift all over the plate. But that became too Gothic so I burnished which allowed the image to breathe again.